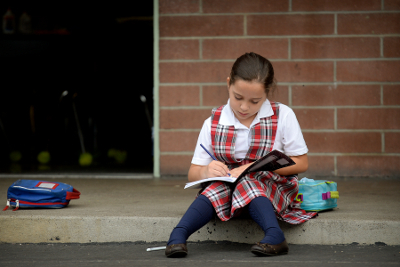 Our Lady's School provides a rich and balanced academic curriculum that is in alignment with the standards established by the Diocese of San Diego and California State Standards. (For a more detailed description of the California Standards, please visit www.cde.ca.gov/ci. Our goal is to develop the whole child. We challenge our students to grow to their full potential so that they are equipped for success. At each grade level, we utilize a variety of instructional methods to address individual learning differences. Time management, organization, and other essential life skills are a regular part of the teaching process in all grade levels. Our academic curriculum includes instruction in the areas of: religion, English, reading, spelling, handwriting, mathematics, science, social studies, computers, art, and physical education. Computer time is scheduled for students in every grade. Beginning in the Fall, 2017, we introduced a dual language program in Spanish and English in our Transitional Kindergarten and Kindergarten classes. The goals of this program are to promote bilingualism, bi-literacy, academic achievement and multicultural awareness for all our students. In Transitional Kindergarten through 5th Grade, students will be taught in Spanish for half of the day and English for the other half of the day. Our goal is to have all our students able to speak, read and write fluently in both Spanish and English by the 5th Grade. Spanish will be taught as an academic subject in Grades 6-8 starting in Fall, 2023 as the dual language program is completely incorporated into the curriculum.